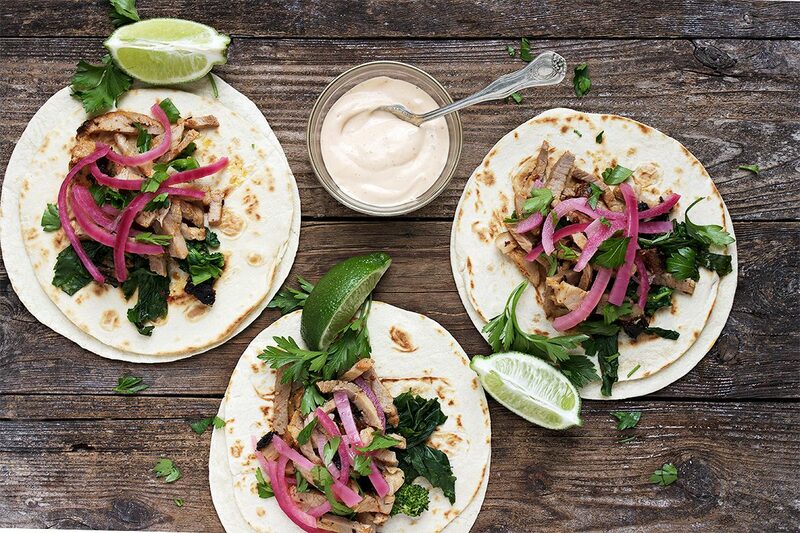 Delicious porchetta meets tacos in these Porchetta Tacos with Broccoli Rabe, with blanched broccoli rabe, quick pickled red onions and a spicy chipotle mayo. A great twist on the classic! Porchetta sandwiches are classic, but porchetta tacos just might be the new classic. Loaded with flavourful porchetta, nutty and slightly bitter blanched broccoli rabe (rapini), tangy pickled red onion and creamy, spicy chipotle mayo, these tacos were one of the best bites I’ve enjoyed in a while. The combination of flavours is unbeatable! Disclosure: This post is sponsored by Andy Boy Broccoli Rabe. As always, all opinions are my own. Broccoli Rabe is the perfect foil for porchetta and the combination was borrowed from the classic sandwich. Beyond adding a wonderful flavour profile to these tacos, broccoli rabe is loaded with vitamins and minerals. 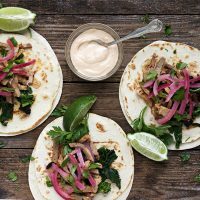 These tacos are a great use of left-over porchetta, or to start from scratch you can use your favourite porchetta recipe or try my quick and easy porchetta recipe below. (It is impossible to find a large piece of pork belly around my area, so I use either a pork loin or a pork shoulder. If you can find a large piece of pork belly, that would be most authentic). You can make all the parts of these tacos ahead and refrigerate. Then just assemble when you are ready to eat. 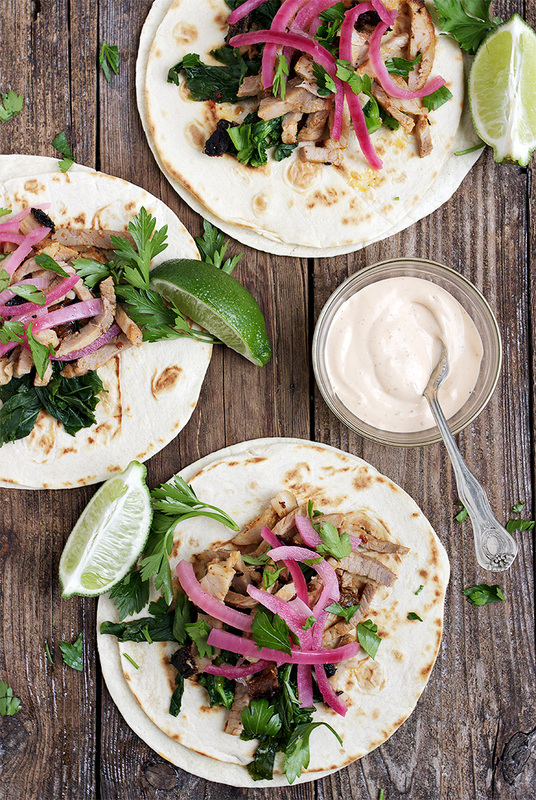 Delicious porchetta meets tacos, with blanched broccoli rabe, quick pickled red onions and a spicy chipotle mayo. 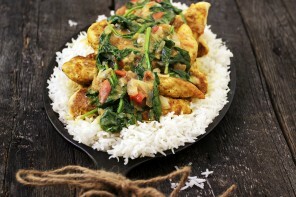 A delicious twist on the classic! For the spice rub: Combine all ingredients except the olive oil in a small food processor, mortal and pestle or spice/coffee grinder. Add the olive oil and process until you have a paste. Set aside. Prepare the pork: Using a sharp knife and cutting from the long side, cut underneath the fat cap, between the fat and the meat almost, but not all the way across to the other side. Once cut, fold it back out of the way. Cut down the centre of the pork, lengthwise, almost but not all the way through. Fold it open like a book. Repeat this cut with the two pieces you just cut. Press to lay flat out a cutting board. Cover with plastic wrap and using a mallet or heavy skillet, pound down to flatten a bit. Remove plastic. Rub 1/2 of the spice rub on top of the pork. Starting from the end without the fat, start rolling up the pork and when you get to the fat cap, fold it over the top. Rub the outside of the pork with the remaining spice rub. Secure the pork with cooking twine every 2 inches. Refrigerate uncovered at least 2 hour, or preferably over-night. To cook the porchetta: Preheat oven to 475° F. Place porchetta fat side up in a shallow baking pan and place into preheated oven. Cook for 20 minutes, then reduce heat to 325° F. and cook until thermometer registers about 135°. F in the thickest part, about 75-90 minutes (for 1 1/2 lb. roast). Allow to rest at least 20 minutes, then remove the string, slice and then roughly chop. Place in a bowl and toss with some of the pan drippings. Proceed to make tacos immediately or refrigerate, covered, for up to several days. Make the Quick Pickled Red Onions: Boil a kettle of water. Pour boiling water over onion rings in a large bowl until covered. Let stand 2 min, then drain. In a medium saucepan on the stovetop, boiL the vinegar with the sugar, salt and garlic until sugar dissolves. Remove from heat and add onion rings. Push onion down into liquid so it is mostly covered and let stand for at least 30 min. To store longer, cover and refrigerate. Can be refrigerated up to 1 week. Blanch the broccoli rabe: Bring a large pot of water to a boil. Prepare broccoli rabe by removing the bottom couple of inches of the stems. Place broccoli rabe into boiling water and allow to cook 1-2 minutes. Remove to a colander and rinse briefly under cold water to stop the cooking, then set aside to drain. Before using, blot dry between paper towel and re-warm, if desired. Can be made ahead and refrigerated. Use at room temperature or slightly re-warmed. Prepare the Chipotle Mayo: Combine the mayonnaise and adobo sauce, to taste. Refrigerate if not using immediately. To assemble the tacos: Place 3 stalks of blanched broccoli rabe in the centre of the tortilla. Top with chopped porchetta. Sprinkle with some of the pickled red onion and scatter some chopped cilantro/parsley on top. 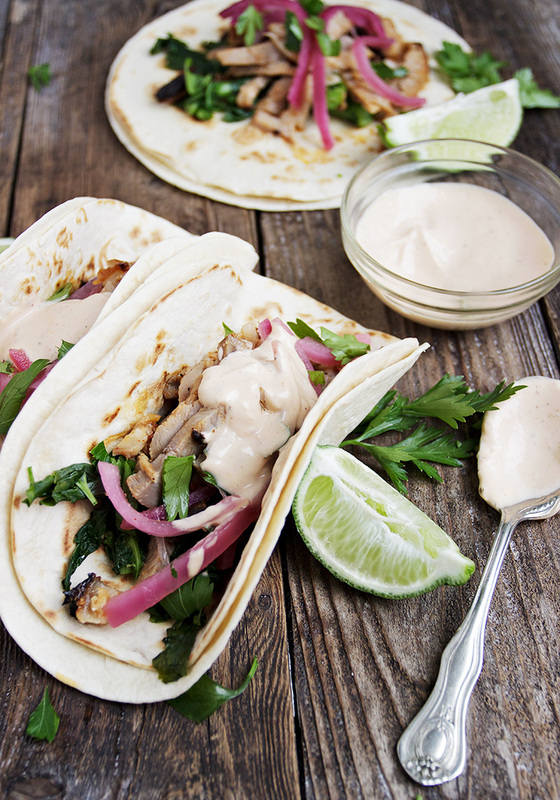 Top with a dollop of chipotle mayo and serve with a lime wedge, for drizzling. You can use either a boneless pork loin or boneless pork shoulder, or if you are lucky enough to have access to a large piece of pork belly, that would be ideal. All of the components of these tacos can be made ahead and refrigerated. You can serve the broccoli rabe and/or porchetta at room temperature or re-warm, if desired. 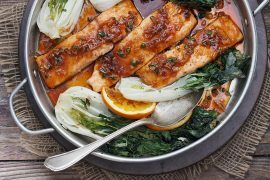 *You can substitute chipotle chilli powder for the adobo sauce, or even smoked paprika with a little cayenne, for some heat. Adjust amount of any of these to your taste. For a different taste, try a homemade salsa verde in place of the chipotle mayo. Porchetta in tacos?!?! GENIUS! Seriously, this is taking tacos to a whole new level, girlfriend! LOVE the broccoli rabe, pickled red onion and chipotle mayo in these too! I bet these tastes beyond delicious! Cheers, Jennifer! Thanks so much Cheyanne and yes, you can’t ever go wrong with Porchetta! 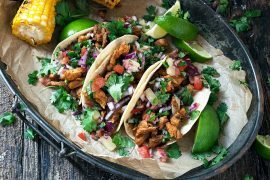 I must give these tacos a try for Taco Tuesday next week! :) Love the broccoli rabe and pickled onions too! this is a crazy delicious combo of flavors. that bitter broccoli rabe balanced with those pickled onions and spicy mayo. and that porchetta!!! this is a very special taco and i cannot wait to try. I could eat anything and everything in a taco and especially all these beautiful ingredients. Love the bright color from the broccoli rabe and the pickled onions. I bet these are really tasty :) I’ve been experimenting with a marinade for pork loin but now I want to put it on a taco! What tasty looking tacos Jennifer!! Great combo with the broccoli rabe and pickled onions! I love that tacos come in all flavors these days. Porchetta sounds like a wonderful base and I love the spicy mayo and freshness and pretty green color from the broccoli rabe. Pinned!